View of the Astros’ Minute Maid Park from the sports deck at the 500 Crawford apartments. 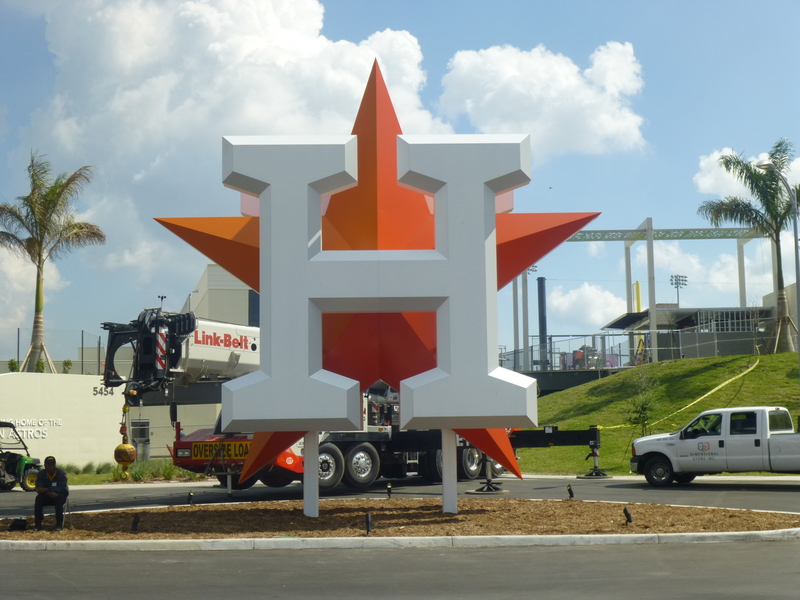 HOUSTON – (By Michelle Leigh Smith) – Opening Day for the Houston Astros baseball club has a special meaning if you live in the 500 Crawford apartments. It means you can walk from your apartment to the Astros game in about 10 seconds. So it will hard to be late for the Astros first game of the season on Monday night against the Seattle Mariners. “There’s not an apartment building in the country with an entrance this close to a major league sports stadium,” says Mark Sullivan, a spokesman for the 500 Crawford community. 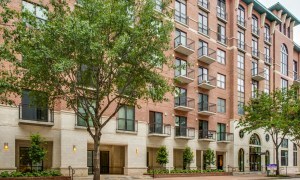 The new 400-unit midrise multifamily community is situated near the left field wall of Minute Maid Park. It would take a super-hero smash by a slugger such as the Astros’ Carlos Beltran or George Springer, but if any human could hit a ball far enough over the left field wall it would hit the 500 Crawford apartment building. Even though the Houston apartment market is extra competitive right now, the new 500 Crawford multifamily community is 70 percent leased. Finger Companies, the developer of 500 Crawford, has capitalized on the baseball-oriented location with some big-league sports amenities – namely, a rooftop residents’ sports lounge on the sixth floor with a view into the Astros’ stadium. Well-appointed with huge TV screens, the Sports Lounge overlooking the Astros scoreboard is great for viewing parties. Leather furnishings selected by interior designer Sherry Zucker present theme-appropriate seating. Finger’s designer April Littmann chose the art. “We wanted a sports memorabilia theme since it’s across from the ball park,” says Sherry Zucker, of Brittany Blake Interiors. The 500 Crawford is not the first downtown Houston venture for Finger Companies, which also built the One Park Place high-rise residential tower across from the Discovery Green park. And if the Astros make it to the World Series and the stadium crowd gets a little rowdy, residents don’t have to worry. The entire building is soundproofed, with six inches of concrete between each floor. 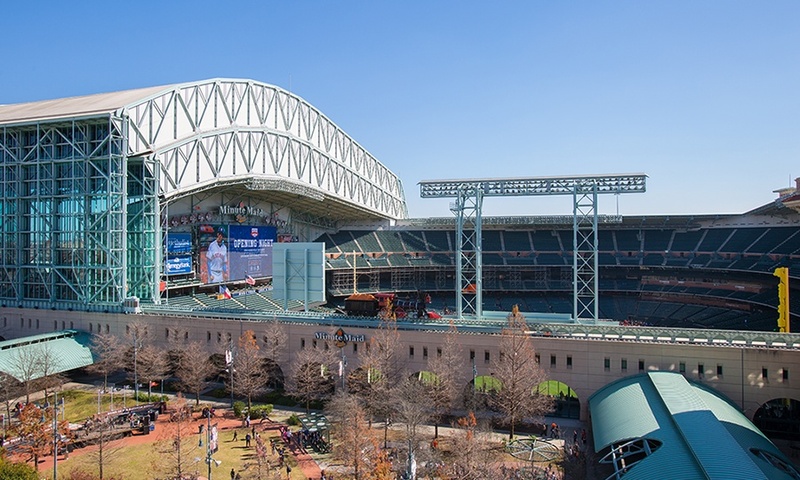 “They’ve hired a sound engineer to soundproof the building to make sure residents are not bothered by noise, even if the roof (of Minute Maid Park) is open and the crowd is roaring,” says Sullivan. Even though a lot of new apartment communities have hit the market lately, 500 Crawford is already 70 percent leased. Monthly rents start at $1,500 for a one-bedroom and $2,400 for a two-bedroom, two-bath unit. Two new restaurants are part of the 500 Crawford building, including Astros owner Jim Crane’s elegant Potente, an Italian masterpiece destination that will be open in the evenings. The more casual and rustic Ossa & Kristalla, Italian trattoria offering wood-fired pizzas, fresh local ingredients for pastas, salads and sandwiches opened last month. The apartment community, located at the intersection of Crawford and Texas Avenue, is also across the street from the Vic & Anthony’s steak house operated by Tilman Fertitta’s company. And walk-ability is a big deal in the downtown market. Consider the walk-ability stats from the 500 Crawford building. And for baseball fans, here’s the big one: it’s only 38 steps to the Left Field Gate of Minute Maid Park.